This is a really important post, so I wanted to take my time and make sure I got it right. Anti-radiation stickers, shields, neutralizers, etc are becoming more and more popular, and I think it’s time we talked a bit in-depth about how these products work, and what I think about them. However, it’s honestly a bit difficult for me to do this, let me tell you why. Anti-Radiation Stickers – Can We Trust Them? Do They Work? In the last year alone, I have personally tested and reviewed over 70 different EMF Protection products. From cell phone and tablet cases to baby blankets and even boxer briefs, I’ve tested it all. Sometimes I buy the products, and sometimes they are sent to me by companies looking for my review (don’t worry, I never let this sway my opinion). However one product I’ve always had a hard time testing, are anti-radiation stickers of any kind. 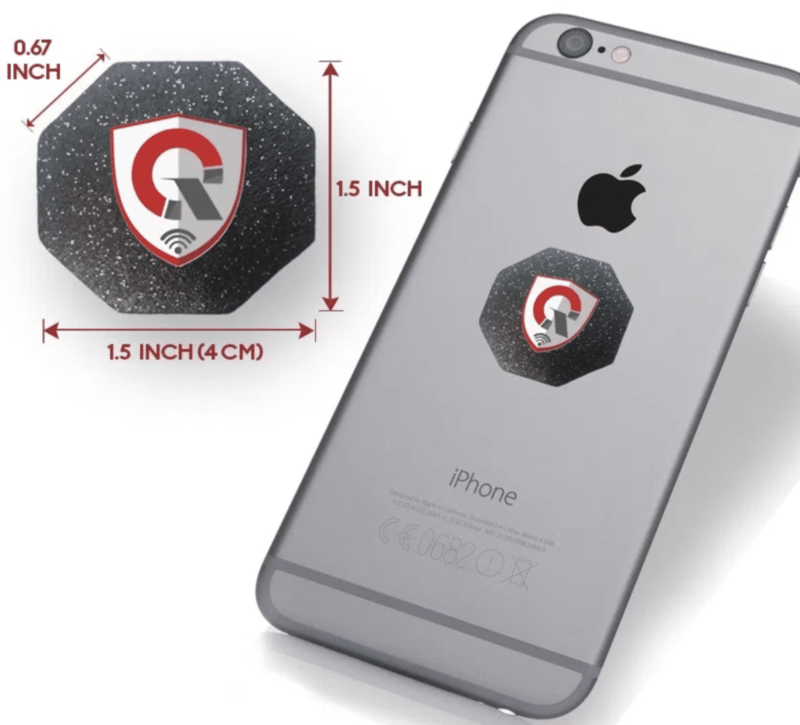 The concept here is that it is a sticker, with various technologies embedded inside, that theoretically helps protect the user from the EMF radiation emitted from their cell-phone, tablet, laptop and more. The main problem for me when it comes to EMF protection stickers, shields, etc, is that I cannot easily test them. If you look at most of the products on my recommended products page, most of those are easy for me to test, and to understand how they provide protection. Many of these products provide a physical barrier between the source of the radiation, and your body. This can be tested and proven fairly easily. However when it comes to anti-radiation stickers of any kind, this can’t really be done. We’ll talk a bit more about how the products work down below, but for the sake of this section, just trust that the concepts most of these companies mention can’t be tested by ordinary means (or at all). On top of that, the fact that more and more people are waking up to the dangers of EMF radiation, entices companies to enter the market with completely unproven, untested products. So, not only do we have to battle difficult to understand ways that these products supposedly protect the user, but many of the companies lack any research or science whatsoever. So, what I’m going to do in this guide, is go over some of the “best” and most popular EMF protection stickers on the market, and break each one down. We’ll talk about how it is supposed to work, what it’s made of, and I’ll give my general thoughts. I’m going to avoid saying whether I think they work or not, because I can’t honestly do that. After I’ve gone over a bunch of these, I’ll go over what I think are better ways to protect yourself from cell-phones, tablets, laptops and more. Now, when I say “best,” I don’t necessarily mean they work the best, because I can’t know that for certain. What I mean is that they are companies and products who have publicly available research and science showing their product does, or may, work. There are such an enormous amount of products on the market, that I won’t even be able to get close to listing them all here. If you want information about any specific products not listed here, comment at the end of the post and I’ll do my best to give you my opinion. Alright, let’s take a look at some products. See the product on Amazon. Aulterra has a whole line of EMF protection products, with this and their whole house plug being their flagships. If you want to read all about the company, the founder (interesting story) and read reviews of all their products, you can check out the post I wrote here. They have been making EMF products since 1997, that’s 21 years! Research on the Aulterra Neutralizer has been published in scientific research journals. They have over 30 separate pieces of research on their products, everything from University studies to independent labs, all of which is available on their website. All of this tells me that this product is, at the very least, worth a try. Any company that has been around LONG before EMF protection products were trendy, tells me they really care. I also think it’s incredible the amount of money and time they have spent on research and development. How Does The Aulterra Neutralizer Work? 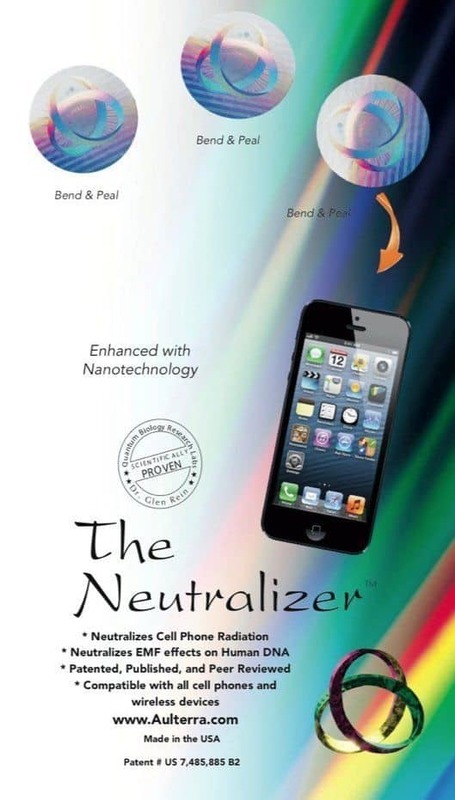 The Aulterra Neutralizer uses rare paramagnetic minerals to retune the EMF radiation frequencies and transmute the harmful energy from modern devices. This retuning makes the EMF radiation no longer harmful to the human body. Inside the Aulterra Neutralizer are three micro-thin layers of paramagnetic minerals that offer powerful EMF neutralizing technology. The naturally occurring coherent fields from the Aulterra minerals are able to completely harmonize the incoherent electromagnetic pulses from mobiles phones, and return them to coherent and natural frequencies, which are no longer able to harm biological systems. So, although I can at least wrap my head around how this would work theoretically, I’m not able to test it. 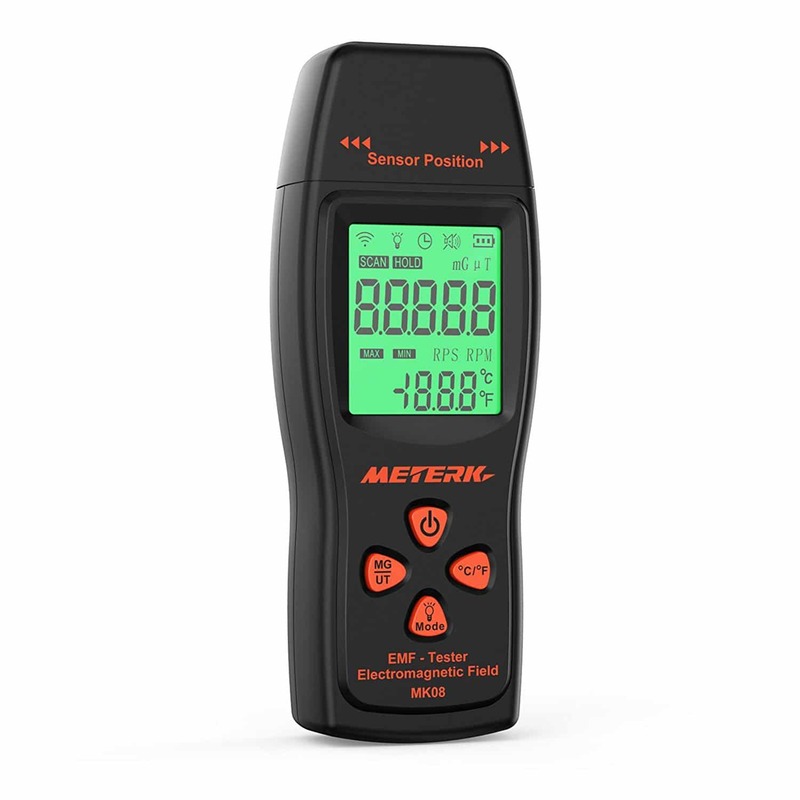 I currently own 7 different EMF meters, but none of them will show any sort of reduction from this product. That is because it doesn’t technically reduce, remove, or block the EMF radiation, but instead changes it. The only way to know if this product is really working, is to test it for yourself. They have plenty of reviews on their website from people who could feel a difference right away, and that is something I can get behind. If you are electromagnetically sensitive (usually called EHS, read more here), then you will likely be able to simply feel if a product is working for you, and providing protection and relief. However, if you’re like myself, and concerned but not overly sensitive to EMF radiation, then that won’t be the case. Instead I would just have to rely on the, albeit impressive amount of, research Aulterra provides. I get emails all the time from people asking my thoughts on Earthcalm’s products, and probably for good reason. Earthcalm has been a big player in the EMF protection space for a while, and has gained a huge following. I have not personally tried or reviewed, any of their products yet myself, which is why I don’t talk about them too much. I will say that I am hoping and planning to try their products in the first few months of 2019. They have a variety of products, but the one I want to focus on here, is their Quantum cell, which is their version of an anti-radiation sticker. 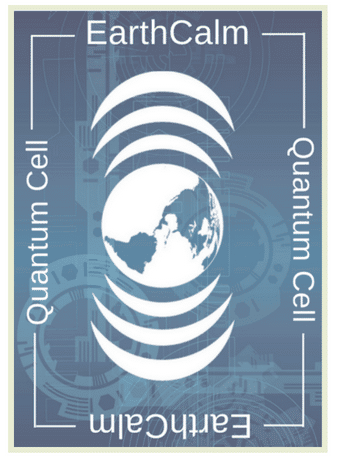 Like the Aulterra Neutralizer, and the Quanthor product, the Earthcalm Quantum cell is also an extremely thin sticker that you can place on your cell phone, tablet, wireless device or even your vehicle. How Does The Earthcalm Quantum Cell Work? …effectively reverses the damaging effects of EMFs, and it also increases the conductivity of human DNA. It is because of this fact that we view our Quantum Cell as a critical addition to absolutely anything that produces RF and microwave radiation. These circuits work like antennae, and are able to amplify natural energies around you. When our bodies are more energized in this way, our bodies built up a resonance that reduces the harmful effects of EMF’s. I’ll be honest, even after reading all the documentation available on their website, I still don’t fully understand it. However, I am impressed with some of the research that they have available on their site. One thing that I found of personal interest after reading research on all of these different anti-radiation stickers, is that two researchers: Dr. Glen Rein, and Dr. Lisa Tully showed up more than once. Specifically, they were both listed in the Research of the Aulterra Neutralizer, and the Earthcalm Quantum Cell. In the end I can’t really say whether this product works or not, however they have a wealth of reviews that feel it does. Check out the research and reviews for yourself if you’re interested in trying out the Earthcalm Quantum Cell. I’ve talked about Quanthor’s products before, in fact you can check out my full review of their product line here. But, for this post, I want to focus in on one of their products, the Quanthor EMF protection sticker. Let’s talk about how this product is supposed to work. Quanthor says that the combination of these semi-precious minerals contain special oxides and magnetic properties (perhaps like the paramagnetic properties of the Aulterra product) that when precisely balanced, protect the body from EMF radiation. The sticker is also supposed to generate it’s own Schumann Resonance (7.83hz) which provides healing energy to the body. Like the Aulterra Neutralizer, the product couldn’t be simpler to use, you just apply the adhesive disk to the back of your phone, and you are supposed to be protected. I can’t vouch for whether or not this product works, so I’ll just mention some of the reasons I placed it high on my “Best anti-radiation sticker” list. Was granted A U.S. patent for their EMF protection and bio-healing technologies. They are also a company that has been around a while and seems to take pride in their products, research, and customer service. What About All The Other Anti-Radiation Stickers on Amazon? There are way too many EMF protection stickers, diodes, discs, shields etc. available for me to cover each one individually. Some of the other products, just like these, may indeed work. Unfortunately for these products, they are flooded alongside the dozens of other products that have entered the market in the last few years that are certainly not real. Don’t trust the claims without real research to back it up. Most of these other anti-radiation stickers have absolutely nothing to back them up except ridiculous claims. Many of these products are purchased in China, and then just given different labels once they reach their destination. If you have a specific product you believe in, or feel has quality research to back up the claims, be sure to let me know in the comments so I can look into it. What Should I Use Instead of an Anti-Radiation Sticker? I personally use, and recommend, the Defendershield EMF Protection cell phone case, you can check out my full review of their product here. I think that is the best product on the market, but any quality EMF protection case I believe will protect you far greater than any anti-radiation sticker. These cases provide a physical barrier between the source of radiation, and you’re head. Usually, they have a front flap that you close before you make or recieve a phone call, and it deflects the radiation away from you, protecting your head. The other thing I would suggest you do, is checkout my post on reducing your exposure to smartphone radiation. It has 17 different ways to lower your exposure to EMF radiation from any smartphone, and it has a ton of great tips. I certainly think their are EMF protection stickers on the market that could very well work. I just can’t test them to know for sure. Ultimately you have to rely on research, reviews, and your own experience. I hope you found this article helpful, as I learn more about how these technologies work, I’ll continue to update this post with what I know. Could we try these anti emf on insects or animals? That’s an interesting question, I’m not sure what the best way to go about this would be. Thanks for posting your honest opinion. I often wonder about these stickers. I have a shunghite disc on my phone and use the harmony pendant. Going by feel is really the only way to tell. I also have a safeshield phone case on my phone. I have noticed a slight difference and I am EMF sensitive. I always have my phone in airplane mode or turned off despite the disc and phone case as well. Keep these articles coming. I am really concerned about the upcoming 5G and its health affects on all living beings. Hey Tammy! Glad you enjoyed the articles and thanks for giving your opinion! I’m glad you’re noticing a difference with the products you’re using, and it sounds like you are doing all the right stuff! I’ll have some articles coming out soon on 5G, I agree, it’s a huge concern. Hey Diana! I’ll look into that product! I’m so glad you appreciate the website, I do it for people just like you! have you seen this video / product? Interested on your thoughts on the testing method shown as well as the product…. I just watched the video, I hadn’t seen it before, nor had I heard of the product. The product is similar in design and concept to some of the products I reviewed in this article, but I’m going to reach out to them to learn more and test the products for myself (the best I can). As far as the testing method in the video, it is far from conclusive. A mountain of research shows us that EMF radiation does not need to have a thermal aspect whatsoever to cause damage, so a heat map of the head does not tell us anything about the radiation being absorbed. I think it’s a flawed test, that is visual convincing, which is why they used it. I’ve heard a lot about shungite lately. How does it rate as an EMF radiation shield? Great question. I did write an article on shungite: https://emfacademy.com/shungite-complete-honest-guide/ but honestly I need to go back and edit it a bit for this reason. I see shungite sort of like I do these anti-radiation stickers. I think there is a small chance it works and provides some level of protection. However, there honestly isn’t a great way to test it or know if it’s working. I would say it a shungite pendent makes you feel better personally, then it is probably a good thing. However, I would make sure that you follow smart steps to reduce your overall exposure to EMF radiation, and get some products you know will work. 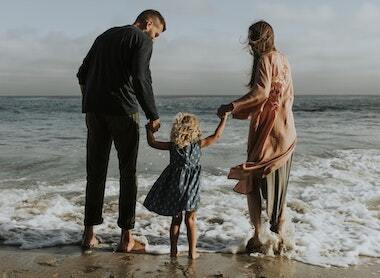 Hi Christian, thank you so much for all the fantastic work that you do, and for sharing all this information which essentially is life changing for our families. I was told that the Tesla Blushield EMF protection devices are great for overall home protection etc. I looked at some feedback online it seems that there are both positive and negative testimonials; a few Youtube review videos seem too ‘sales-y’ and inauthentic. The Tesla series is very pricey and before investing I thought my first stop is to come to you for advice. I’ve heard of these products but haven’t tried them myself, let me look into them a bit more and get back to you!